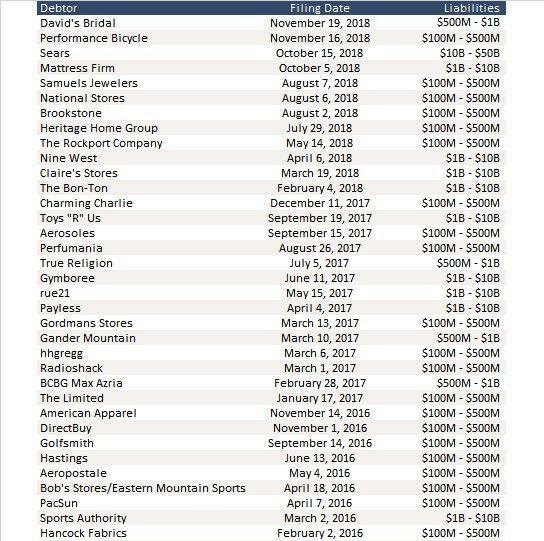 At the start of March in a span of just 48 hours, several big names in the American mall industry announced they would be slashing store counts to the tune of over 300 stores. Gap said during its earnings call that it is going to shutter 230 locations over the next two years, just hours after JCPenney said that it would close 18 of its department stores. This news came after L Brands said they were going to close 53 Victoria’s Secret stores in North America this year according to Bloomberg. The icing on the cake was when “disruptor” Tesla recently announced all of its sales would be moving online, which was a nice way to say that almost all of its retail locations – many of which are located in malls – were going to close (since then Musk appears to have flip-flopped and as of this moment, the fate of Tesla’s retail operation remains unknown). These closures followed a number of high profile bankruptcies in the “bricks and mortar” space: Payless Inc. just went bankrupt for the second time in two years, bankrupt Sears was minutes away from liquidation, while perennial mall tenant Brookstone filed for chapter last August, slashing the size of their operations – and once American mall staples like Gymboree, RadioShack, Bon-Ton Shoes and Wet Seal all filed for bankruptcy over the last half decade. Payless is going to be abandoning its 2500 stores, while Things Remembered will also be closing most of its 400 stores. 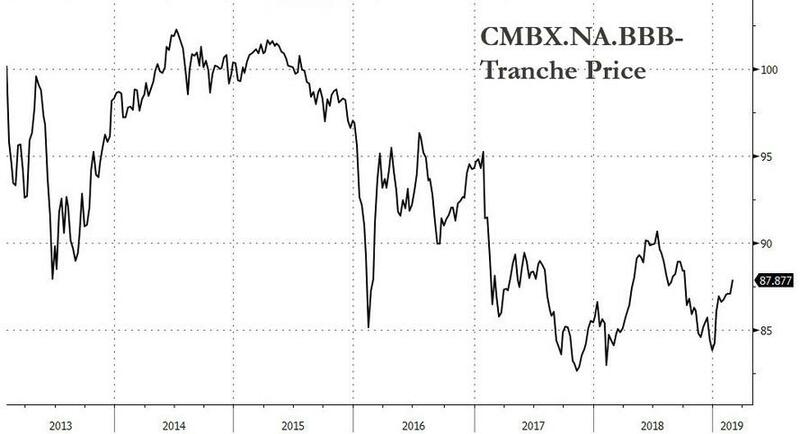 Now, three weeks later, none other than Goldman has decided to echo what we said at the start of the month, and is urging its clients join the “big short” bandwagon by going short CMBX AAA bonds (while hedging in a pair trade by going long five-year investment-grade corporate CDX). 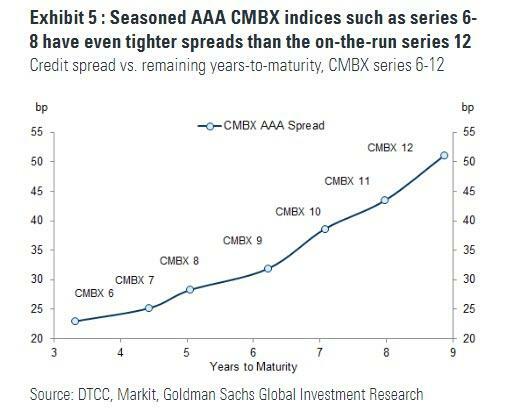 … Goldman points out a discrepancy, namely that at the same time, spreads on AAA CMBX indices have moved to historically tight levels: tight vs. other fixed income instruments such as CDX IG, and tight even relative to the spreads on the exact CMBS cash bond underliers referenced by the AAA CMBX products. And while that means that the highest-rated commercial mortgage loans are paying off on time now, with few default concerns on the horizon, Goldman’s credit analysts Marty Young and Lofti Karoui fear that this scenario could easily reverse if commercial real estate prices start to decline. Citing the bank’s recent review of potential areas of financial imbalance across the US corporate and household sectors, Young notes that stretched CRE valuations ranked near the top in terms of risk level; and while a large and immediate commercial property price downturn is not the bank’s baseline forecast, “a scenario with falling commercial property prices in the next 1-2 years is one to which we would attach non-negligible probability” the analysts caution. Of course, there is not just one AAA CMBX series, but rather 7 – from series 6, representing deals issued in 2012, to the on-the-run series 12 which references bonds from deals issued in 2018. 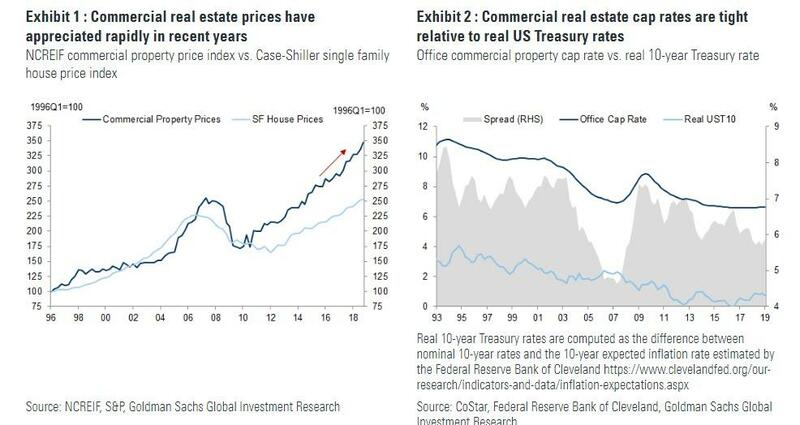 So what index should investors who wish to put on the big commercial real estate “big short”, bet on dropping? 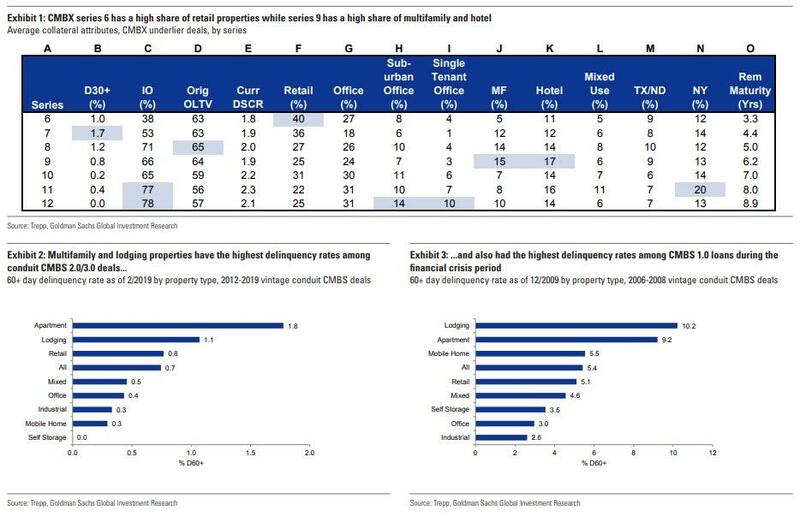 As a reminder, when the “big short” commercial real estate trade first emerged in 2017, investors were originally betting on the Markit CMBX Series 6, that references CMBS bonds from 2012, as the series 6 deals have a high (40%) concentration of loans backed by retail properties, a sector facing secular pressures. Vintages after series 6 have less retail exposure, but these later series necessarily have higher exposure to other property types, many of which also have distinct risks. Series 12 deals, for example, have high shares of single-tenant and suburban office properties, and high shares of mortgages which pay interest-only, with no principal amortization. Why is this notable? Because regular readers will recall that the 2007/2008 financial crisis really kicked in only after Goldman’s prop desk started aggressively shorting various RMBS tranches, both cash and synthetic, in late 2006 and into 2007 and 2008, with the trade eventually becoming the “big short” that was popularized in the Michael Lewis book. Will Goldman’s reco to short CMBX-6 AAA be the trigger that collapses the house of cards for the second time in a row? While traditionally lightning never strikes twice the same place, the centrally-planned market is now so broken that even conventional idioms have to be redone when it comes to the world’s (still) most important trading desk. In any case, keep an eye on commercial real estate prices: while residential markets have already peaked with most MSAs sliding fast, commercial may just be the first domino to drop that unleashes a tsunami of disastrous consequences across the rest of the market.